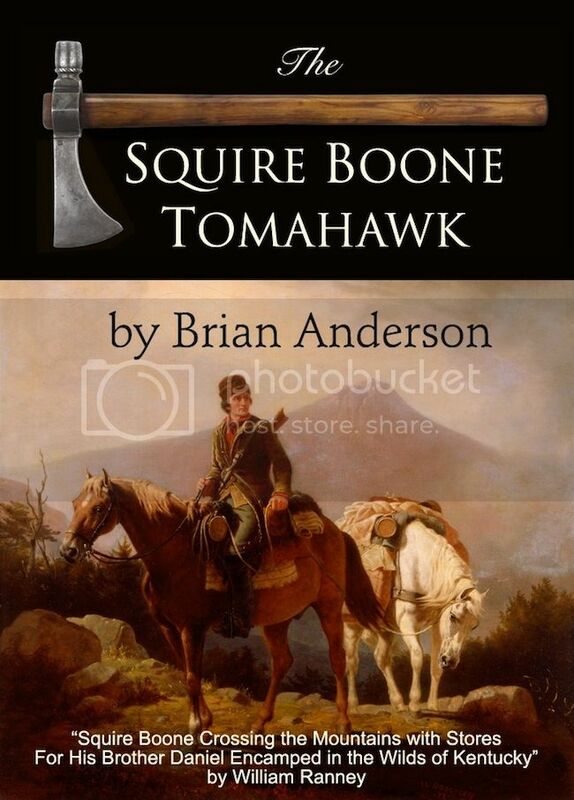 Brian Anderson of Bristol Vermont is a well-known gunsmith, artist, teacher, and blacksmith, and he offered to put his skills to work for our 2013 “CLA Fundraising Auction” by making us a copy of the “Squire Boone Pipe Axe”. When you think of the Boones, you don’t often think of their involvement in the War of 1812, and the little known story of Squire’s personal pipe ax is a good illustration of that point. Unlike their war service, it is generally known that the Boone brothers, Daniel and Squire were both handy at the forge, so handy that they even made guns. Several artifacts still exist that are attributed to their hands, including a very special pipe axe that is currently curated by the Indiana Museum. The axe was originally forged by Squire, and later traded to his brother-in-law, Mr. Benjamin Van Cleve, for a cow. Then, during the War of 1812 Benjamin’s soldier son William carried and used the family heirloom all the way to the Battle of New Orleans. Brian Anderson copied Squire’s work by forge welding several pieces of wrought iron buggy tire into a bar or billet that was hammered out into the tomahawk head, accurately copying the Boone piece right down to the inserted steel bit. Next, following tradition, a small section of rifle barrel was fitted and brazed onto the head to serve as the pipe bowl. After that everything was patiently hand worked and filed into its final shape. Finally, just like Squire did on the original, Brian used an ash sapling for the axe’s haft. From whimsical folk art pieces like his wonderful forged iron “Salamander on Wheels” to exacting copies like the “Squire Boone Pipe Axe” made for the 2013 CLA Fundraising Auction, Brian Anderson is a master of his craft, and we are proud to have this special piece in our auction.